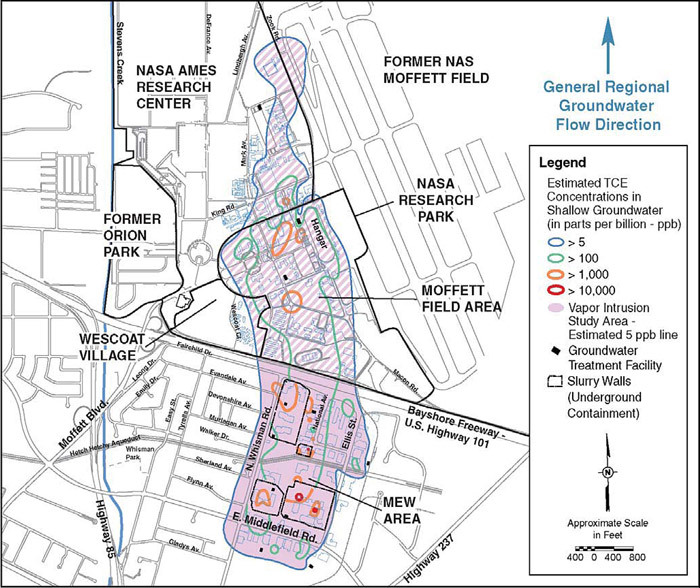 For more than three decades, the Former Naval Air Station Moffett Field and Middlefield-Ellis-Whisman (MEW) Superfund Site regional plume (Moffett-MEW Regional Plume) has been one of the most challenging groundwater remediation projects facing the nation. Despite the hundreds of millions of dollars spent on characterization and remediation, it is likely to take many more decades to achieve RAOs. The site is complex in its sources, hydrogeology, pathways, and land use. Multiple source areas contribute to comingled source areas and comingled groundwater plumes. Complex hydrogeology makes characterization and remediation challenging. The multiple responsible parties performed numerous site investigations over many years, and making sense of the massive amount of data has proven challenging. The regional plume has multiple responsible parties, including two federal agencies and six large industrial companies. State agencies are party to the original Navy and recent NASA Federal Facility Agreements, but USEPA is the sole oversight authority for the private-party portion of the plume. The site has served as a national model for both public participation and property reuse, and is emerging as a model for adaptive site management. The Moffett-MEW project consists of four NPL sites in Mountain View: Fairchild Semiconductor, Intel, Raytheon, and portions of the former Moffett Naval Air Station, also known as Moffett Field. Beginning in 1981, investigations conducted under the supervision of the Bay Area Regional Water Quality Control Board identified groundwater and soil contamination caused by leaking underground industrial storage tanks throughout Silicon Valley, where Mountain View is located. The largest releases took place in or near a 0.5 square mile industrial park roughly bounded by U.S. Highway 101 and Middlefield Road, Ellis Street, and Whisman Road. Some of the groundwater contamination flowed North under U.S. Highway 101, where it mixed with the largest of three groundwater plumes at Moffett Field. In 1990, USEPA issued a Unilateral Administrative Order to Fairchild, its successor Schlumberger, and seven other companies, and early the next year Intel and Raytheon signed a Consent Decree with USEPA. The MEW site was home to several semiconductor and other electronics manufacturing facilities and metal finishing facilities. While in operation, these former facilities required the storage, handling, and use of a variety of chemicals, particularly volatile organic compounds (VOCs). The primary chemicals of concern at the MEW site are trichloroethene (TCE) and its degradation products: cis-1,2-dichloroethene and vinyl chloride. During operations, some of the chemicals leaked or were otherwise released to the ground, contaminating soil and groundwater. In 1981 and 1982, investigations at these facilities confirmed that high concentrations of these contaminants remained in the soil and groundwater. Much of the area has been either redeveloped or proposed for reuse by tech companies, after the original manufacturing companies moved to cut costs. For the most part, the reuse has been considered a great success, and in 2000 it was documented in USEPA’s Superfund Reuse Initiative brochure. Today the MEW area houses companies such as Google and Symantec and has desirable commercial real estate. Developers are now interested in building new tech-industry offices above the source areas and in residential redevelopment of contaminated areas just west of the main plume. The area land use is now a mix of industrial and residential facilities, creating a complex mix of complete pathways that must be evaluated in any risk assessment. Drinking water wells for the City of Mountain View are located a half mile upgradient of the site to the southwest. These wells provide a fraction of the city’s current supply and serve as a contingency supply. In 1986, Mountain View shut down its largest supply well, in part because it was a half-mile from the regional plume. TCE has been the principal risk driver. Using conventional groundwater sampling techniques, concentrations in the upper aquifer reached 1,000,000 ppb. Other chemicals of concern include: tetrachloroethene (PCE), cis- and trans-1,2-dichloroethene, vinyl chloride, 1,1-dichloroethane, 1,1-dichloroethene, 1,1,1-trichloroethane, Freon-113, chloroform, and 1,2-dichlorobenzene. At the Raytheon site 1,4-dioxane was also detected, prompting a change in treatment technology in 2003. Contamination has been identified in the vadose zone and in all aquifers, including localized detections of TCE in the deep aquifer (at depths up to 500 feet). The main shallow A-zone aquifer plume is nearly two miles long and more than a half mile wide (Figure 10). Figure 10. Estimated extent of regional TCE in shallow groundwater and vapor intrusion study area (USEPA 2010d). In general, contamination migrated northward in groundwater flowing toward the San Francisco Bay. Some TCE also moved downward, into several aquifers in a mix of interbedded sands, silts and clays, and some dechlorination occurred, as evidenced by the appearance of TCE degradation products. On Moffett Field federal facility property, degradation was more pronounced as PCE and TCE came into contact with a separate petroleum spill. Under California’s Porter-Cologne Act, all aquifers not affected by naturally occurring saltwater intrusion are protected as potential drinking water sources, but a special effort was made to identify and contain the descent of TCE and other compounds to the deep “C” aquifer. Cross contamination of aquifers occurred despite these efforts. When officials discovered that TCE had passed through two abandoned but unsealed agricultural wells and into the deep aquifer, the companies found and sealed as many as 16 old, deep wells (Figure 11). Figure 11. CSM for Moffett-MEW regional plume (USEPA 2012f). At varying speeds and at different times, each of the responsible parties responded to the discovery of subsurface contamination at over 30 areas of concern by excavating contaminated soil, operating SVE systems, beginning localized groundwater extraction and treatment, and building slurry walls around four source zones. In June 1989, USEPA issued a ROD selecting the soil and groundwater remedy for the MEW Site. The soil remedy included: (1) excavation, with treatment by aeration; and (2) SVE, with treatment by vapor phase granular activated carbon. Soil remediation has been completed at all the former MEW facilities. two regional groundwater treatment systems (north and south of U.S. Highway 101) to contain and clean up groundwater contamination using granular activated carbon and/or air strippers. Groundwater extraction and treatment began at the MEW site in the 1980s and is ongoing. Groundwater remediation is expected to continue for many decades until concentrations of TCE and other COCs meet site objectives. The ROD established a TCE site objective of 5 ppb in the shallow aquifers and 0.8 ppb in the C aquifer and below. Groundwater is not currently used for drinking water or other household uses. Continue to verify long-term protectiveness by monitoring the extent of groundwater contamination along the A/A1 and B1/A2 Aquifer plume boundaries. Optimize both the regional and facility-specific systems to enhance plume capture, and evaluate applicable technologies to expedite mass removal and decrease remediation time frames. Evaluate buildings overlying the shallow TCE plume to identify potential pathways into buildings, and implement mitigation measures to reduce elevated levels in indoor air. The last finding incorporated new understanding about subsurface migration of TCE and other VOCs into overlying buildings through the vapor intrusion (VI) pathway and new or revised toxicity information for TCE from 2001. Regulators, responsible parties, and the community are still addressing all three of these issues. To accelerate the reduction of the source of VI (i.e., Site contaminants in shallow groundwater and soil gas) to levels that are protective of current and future building occupants, such that the need for a VI remedy would be minimized or no longer be necessary. The ROD Amendment required indoor air sampling and other lines of evidence to assess VI in existing buildings and the installation, O&M, and monitoring of a subslab/submembrane ventilation system (or use and monitoring of current mechanical ventilation systems for commercial buildings) to meet performance criteria and RAOs. Any new construction was required to install a vapor barrier and passive subslab ventilation system that could be made active. ICs and monitoring were required to ensure long-term effectiveness of the VI remedy. The VI remedy is currently being implemented. VI was not the only argument for reopening the MEW remedy. The regional extraction system worked well—over 104,000 pounds of TCE and other VOCs had been removed. The average TCE concentration had fallen 90% by 2009, with up to 40,000 ppb TCE remaining south of Highway 101 and up to 4,700 ppb at Moffett. However, the Second Five-Year Review in 2009 found that the remedy’s cost efficiency and potential for achieving cleanup goals were decreasing and that optimization evaluations were needed. The same review found that slurry walls were not fully functioning as intended and that some chemical migration was occurring across the slurry walls (meaning that despite two decades of pumping, the plume had not separated itself from the source areas). USEPA consequently prepared a Supplemental FS to update the groundwater remedy and is currently conducting optimization and pilot studies. The RI/FS for MEW was completed in 1988. The Navy signed a Federal Facility Agreement in 1993 to implement the remedy. The RI indicated that contaminated groundwater posed the highest risk to human health. Incremental lifetime cancer risks (ILCR) without remedial action from drinking from hypothetical shallow wells on the property ranged from 1×10-2 to 9×10-3. In 2002, the VI pathway was recognized as a possible risk and actual indoor air concentrations exceeding USEPA’s cancer and noncancer exposure standards were found in several commercial and a few residential buildings. Although groundwater extraction and treatment has been the principal groundwater remedy for the regional plume, numerous projects have demonstrated or used innovative technologies at the site. In 1996, the Navy teamed with Stanford University in one of the earliest demonstrations of permeable reactive barriers. In 2005, the Navy conducted an optimization analysis and installed an additional extraction well in the lower A Aquifer to enhance plume capture in that hydraulic zone. The same year, Raytheon and Intel employed enhanced in situ bioremediation at a site on the southern side of Middlefield Road where groundwater capture was weak. Over the course of the next nine years, they injected multiple rounds of carbon substrate, such as emulsified soybean oil, with and without bioaugmentation. Ongoing monitoring shows that enhanced bioremediation continues to be effective and that the pilot test has not affected indoor air. Between 2010 and 2012, the Navy conducted an in situ anaerobic biotic/abiotic treatment pilot test at three Regional Plume locations, with similar success. By the time the groundwater treatment systems were activated, MEW parties prepared a Plume Definition Report showing that the plume’s boundaries, in all contaminated zones, had been well defined. One polluted private well remained, about 1,000 feet west of the identified plume, but no proof connected this contamination to the main site. For years, most plume maps drew the TCE 5 ppb isopleth down the middle of Whisman Road. Around 2004, when VI became a major community issue, a resident on the west side of Whisman Road, just outside the official plume, requested that the air inside her home be tested. When the indoor air was eventually tested, unacceptable levels of VI were confirmed. The responsible parties installed mitigation fans in her dirt basement. When this information came before the Northeast Mountain View Advisory Council, community members suggested that the extensive groundwater monitoring network was not dense enough to define areas susceptible to VI. Gradually, USEPA and the responsible parties installed more wells along the plume boundaries (Figure 12). While most of the sampling confirmed the interpolated values shown on contour maps, in 2012 high levels of TCE were found in the shallow aquifer along Evandale Ave, west of the plume near U.S. 101. USEPA identified four TCE hotspot areas exceeding 1,000 ppb away from the major plume. Soil gas sampling suggested these were not the results of localized surface releases, but they did coincide with a zig-zagging municipal sewer line. In 2015 USEPA concluded, after extensive investigation, that the historical TCE releases from industrial facilities into the sanitary sewer line, which had served the MEW industrial area until 1966, was the source of high TCE groundwater hotspot areas to the west of the previously defined 2012 TCE Regional Plume boundary. USEPA considers the TCE hot spot areas and extent of TCE contamination as part of the MEW Superfund site and has designated another Operable Unit 3 to which the groundwater and VI remedies in the 1989 ROD and 2010 ROD Amendment applies. USEPA continues to investigate all PRPs related to the new Operable Unit contamination. Figure 12. Delineating the plume in the adjacent residential area. In October 2002, launching one of USEPA’s first major VI investigations nationally, the agency sent letters to the MEW Responsible Parties requiring that they submit work plans “to conduct a human health risk assessment to evaluate the groundwater to indoor air exposure pathway by collecting indoor air, outdoor air, and soil gas samples at each Facility.” Concurrently, USEPA’s RCRA Corrective Action program undertook a similar investigation at the nearby former GTE property. When local citizens heard about the new investigations, they requested a public meeting. USEPA convened a meeting in January 2003, which over 400 people attended. Many attendees were from the new, upscale Whisman Station housing development located above and around GTE’s smaller, lower concentration TCE plume areas. Between 2003 and 2009, the MEW Companies, NASA, Navy, and USEPA “collected over 2,800 indoor, outdoor, ambient, pathway, background, and duplicate samples at 47 commercial buildings and 31 residences in the VI Study Area (defined as the area over the estimated 5 ppb TCE concentration in the shallow groundwater plume, with an additional 100-foot buffer). Buildings with various types of foundations (concrete slab-on-grade, crawlspace, and earthen cellar) were sampled.” (USEPA 2009a). As USEPA better delineated the shallow plume, it found that a 100-foot buffer was unnecessary, but the Study Area grew. There were no immediate or short-term health concerns. TCE was detected above USEPA’s long-term health-protective levels in several commercial buildings and a few residences within the VI Study Area. Discrete mitigation measures (for example, sealing cracks/conduits, upgrading/modifying ventilation systems, and installing air purifying systems) that were implemented in buildings with indoor air concentrations exceeding USEPA’s health-protective levels were successful in reducing indoor TCE concentrations to below the health-protective levels. To date, at least 117 nonresidential buildings have been sampled, with over 40 requiring some form of mitigation beyond the normal operation of heating, ventilation, and air conditioning systems (Figure 13). Over 140 residences along the plume’s western boundary, near the Evandale Operable Unit of the plume, and at Moffett’s Wescoat Military Housing area have also been sampled, along with schools and childcare centers in the area. Only a handful have required active mitigation as described in the 2010 ROD Amendment. Figure 13. Building where TCE VI is being addressed (CPEO 2016a). At several of the facilities, the remedy’s cost efficiency and potential for achieving cleanup goals are decreasing with continued operation, due to decreasing influent VOC concentrations and declining mass removal efficiency. Estimates in the 1989 ROD for the time required to reach the TCE cleanup level for the Deeper Aquifers is between 2 to 45 years. For the shallow aquifers, the cleanup time was estimated to be considerably longer—from 46 years into the indefinite future—because the shallow aquifers are low-yielding and contain soils with high clay content that attracts and retains site chemicals. The Supplemental FS identified five alternatives that combined groundwater extraction and treatment, MNA, targeted in situ redox treatment, and permeable reactive barriers. Targeted in situ redox treatment referred to using any of three in situ redox technologies (in situ chemical oxidation, enhanced reductive dechlorination, or zero valent iron injection). Areas proposed for treatment included all high-concentration areas (concentrations exceeding 1,000 μg/L) in the shallow aquifer and facility-specific source areas with low- to medium- concentrations. Areas where the technologies were demonstrated to be infeasible would use optimized groundwater extraction and treatment. USEPA estimated that in situ treatment would reduce high concentrations in the target areas approximately 50% more in the first decade as compared to the current groundwater extraction remedy. Time frame estimates for the in situ treatment alternatives in the upper aquifer were based on Cleanup Time Evaluation modeling. USEPA stated that the model underestimated source zone efficacy by not accounting for surfactant effects that can greatly enhance desorption and dissolution from soil into the dissolved phase. Modeling assumed an even distribution of contaminants throughout low permeability zones; however, treatment may be more effective than modeling suggests if contaminants only partially penetrated the low-permeability zones. Several lines of evidence suggest that natural attenuation processes are occurring in certain portions of the plume. By including MNA in three of the alternatives, USEPA indicated at some point engineered remediation could be terminated and natural processes would be relied upon to achieve the RAOs, such as a TCE groundwater concentration of 5 ppb. While the FS set criteria for transition to MNA, it did not list specific concentrations. The FS assumed, however, that 50% of the wells with a concentration of 200 ppb or lower would make the transition to MNA. USEPA provided a detailed comparison of the alternatives, using the nine criteria of the NCP. It also estimated the cost of each alternative, based on a 50-year period. Table 17 summarizes the cost for each alternative. Adopting some of the newer or alternative technologies could expand the existing groundwater extraction and treatment remedy. This effort is currently on hold pending the results of additional pilot studies. USEPA did not select a preferred alternative. Alternative 4 was considered the most protective, but difficult to implement. At the time, it appeared that in situ treatment would be applied where feasible while groundwater extraction would continue elsewhere. At some point in the future each area of the plume would transition to MNA, but the FS did not clarify when that would be. Following significant local input from stakeholders, in January 2013 USEPA’s National Remedy Review Board issued its own review of the draft FS with comments for USEPA Region 9 to address. USEPA Region 9 decided to move forward by optimizing the existing groundwater extraction and treatment systems and conducting pilot tests of alternative groundwater technologies at specific source area locations to obtain more information about what technologies and optimization efforts might work in the different facility-specific areas. The final remedial decision is currently on hold pending the results of additional pilot studies. Pilot study characterization was conducted in several facility-specific source areas, using high-resolution sampling and tools such as the membrane interface probe. The results from high-resolution instruments supplemented data from conventional sampling and found compact hotspots with TCE concentrations in groundwater orders of magnitude higher than monitoring well concentrations. At many facility-specific source areas, existing extraction well networks were optimized and pilot tests of in situ treatment technologies were initiated. The Third Five-Year Review report lists 14 specific areas, with P&T optimization underway at most of the areas. In 2014, responsible parties implemented an ISCO pilot study using sodium permanganate at two TCE hotspot areas in a residential area (Evandale Avenue). TCE concentrations decreased from 9,600 to 2,700 ppb at one hot spot and from 100,000 to 28 ppb at the second hot spot (USEPA 2014d). Subsequent sampling detected a rebound in concentrations and additional rounds of injections were completed (Geosyntec Consultants 2015). USEPA reported that ISCO was effective to the extent that the oxidant could be directly delivered to where the contamination was located. 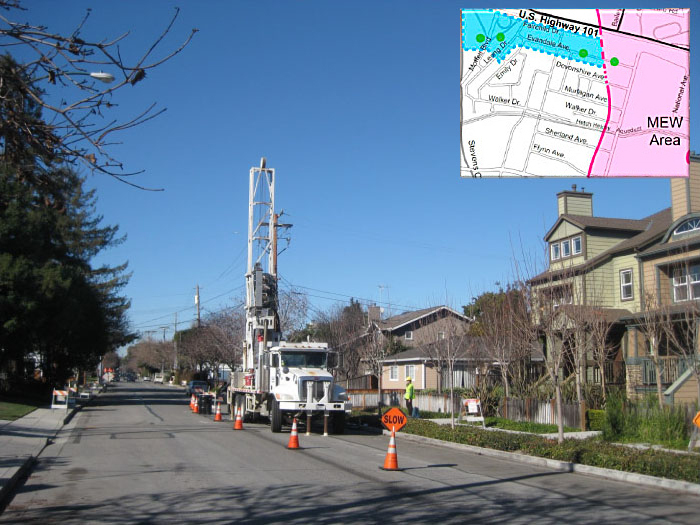 Use of ISCO is likely to be constrained by the presence of subsurface infrastructure and city restrictions on the timing of activity in a residential area. A second pilot project was more controversial. At the former Fairchild Semiconductor Building 9, a site where a 40-foot-deep slurry wall had been placed, a large commercial office building and parking structure was planned. In 2013, Schlumberger Technology (which owned Fairchild from 1979 to 1987) proposed replacing the four extraction wells within the slurry wall with in situ bioremediation. It also proposed replacing a portion of the slurry wall with a permeable reactive barrier. Maintaining an upward, inward groundwater gradient within the slurry wall no longer made sense, because of the risk of VI. In response to a concern about mobilizing metals, Schlumberger proposed using ISCO instead of in situ bioremediation, based in part on the success of the Evandale Avenue project. The removal of the building above the contamination initially appeared to open opportunities for in situ remediation; however, the pressure of timely redevelopment limited what could be done. The long history of public oversight of Moffett-MEW remediation illustrates how informed community members can be constructive partners in the remediation decision-making process, and how communities often contain multiple interests with divergent stakes in that outcome. In 1985, the regional Silicon Valley Toxics Coalition organized citizens who then worked with the city of Mountain View to demand that the Bay Area Regional Water Quality Control Board take prompt action to advance remediation and to urge that the site be placed on the Superfund National Priorities List. The first public meetings about the MEW contamination were convened in 1986. In 1990, the Navy established a Technical Review Committee (TRC) at Moffett Naval Air Station, and it invited local environmental organization representatives to join. Broader than most federal Technical Review Committees, the Moffett TRC was used by the Federal Facilities Environmental Restoration Dialogue Committee as the model for their proposed Site-Specific Advisory Boards. DOD incorporated those recommendations in its 1993 RAB concept, and the Navy converted the TRC to a RAB in 1994. Similarly, both USEPA and the state of California used Moffett as one of the models for their Community Advisory Groups. RAB members worked with congressional delegates to ensure that Moffett remediation was adequately funded. Meanwhile, the Silicon Valley Toxics Coalition first received Technical Assistance Grants (TAGs) from USEPA for both Moffett Field and the MEW Superfund Study Area in 1994. The Coalition formed a Community Advisory Board that selected a technical consultant and directed his work. Those grants have been repeatedly renewed, with the Mountain View-based Center for Public Environmental Oversight taking over management in 2006, reforming a new Community Advisory Board. Through advisory groups, technical assistance, and public meetings, affected residents and other members of the public have had the opportunity to learn about the Regional Plume and to influence remediation decisions. In addition, the TAG recipients have joined USEPA in answering questions from residents, other building occupants, and the press about potential exposures, property values, and remediation decisions. Figure 14. USEPA-sponsored community meeting in May 2014 (CPEO 2014). 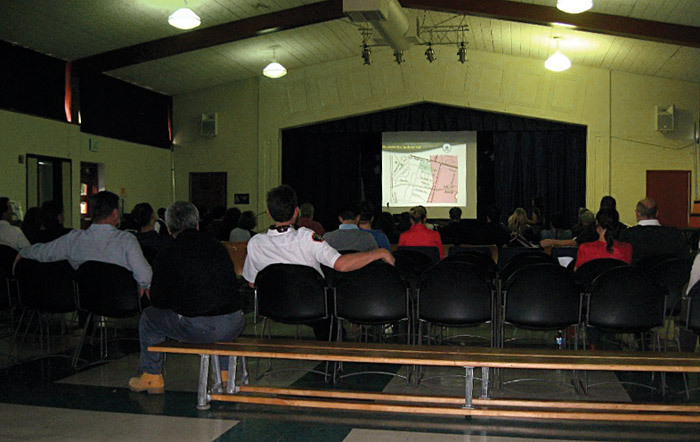 USEPA and the Navy have held a long series of public meetings, working with neighborhood associations, local schools, and even unaffiliated military families living above the plume at Moffett Field (see, for example, Figure 14). In early 2003, shortly after the first VI investigations were launched, 400 people attended at USEPA meeting at Mountain View Recreation Center. Most of those were residents of the homes recently built on the former GTE property, site of smaller groundwater plumes just south of MEW. That meeting led to the formation of the Northeast Mountain View Advisory Council, which met through early 2006. The City of Mountain View has participated in public meetings and the various advisory groups, and has played a central role in two specific activities. First, when asked by USEPA to develop an ordinance requiring VI mitigation, in line with USEPA’s tiered VI response, the city instead created a groundbreaking permitting process. New or reconstructed buildings above or near the MEW plume are required to follow USEPA’s standards for preemptive mitigation. In fact, the city has applied these requirements at other contamination sites. Second, whenever redevelopment is proposed within the MEW area, city staff check with USEPA to ensure that development will not interfere with remediation. USEPA officials routinely attend city council meetings to answer questions. Today, USEPA and city staff are evaluating the possibility, raised in the original MEW ROD, of recycling water being released into storm drains from the groundwater treatment systems. Perhaps unusual for Superfund sites, the land above and near the Regional Plume is highly desirable for both commercial activity and residential use. None of the original MEW property owners and operators—the responsible parties—remain on site. 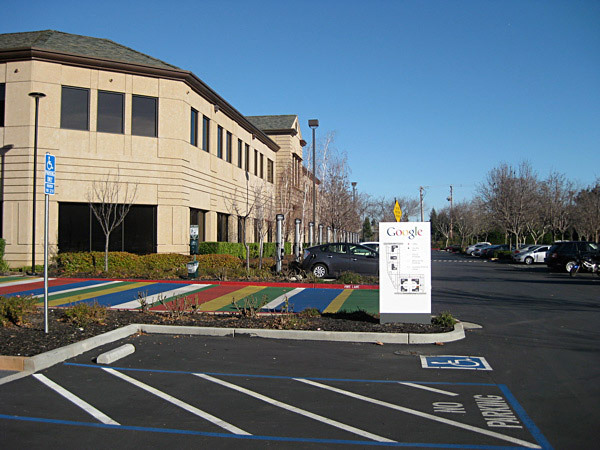 Located in the heart of Silicon Valley, MEW office buildings are occupied by high-tech giants such as Google and Symantec. NASA and the Army took over Navy property at Moffett Field. The Army’s housing area is operated by a private developer, and NASA has leased most the former Navy property to Google, other companies, and universities. Mountain View Commercial Owners (MCO) members own 37 properties comprising 85% of the commercial space in the MEW area south of 101. For ease of access alone, their cooperation is key to both VI mitigation and continuing or enhanced groundwater remediation. Though many of the owners voluntarily share in vapor mitigation activities, they objected to elements of the draft VI remedy that would have made them responsible. For fear of business disruption, their representatives have repeatedly challenged USEPA’s finding that pregnant women exposed to low concentrations of TCE have an elevated risk of bearing children with cardiac birth defects. As described above, this group objects to remediation activity that they believe may spread contamination or interfere with business activity. While the existing remedy is becoming less efficient over time due to an expected decline in mass removal rates, it is protective of human health and the environment and is not becoming less effective over time. The existing remedy continues to meet the RAOs in that it provides hydraulic containment of the source areas and the regional plume and is reducing VOC concentrations in groundwater. With the implementation of the VI ROD Amendment, the potential for VI exposure from shallow groundwater is being addressed, and the existing groundwater remedy remains protective. Although the second Five-year review and the GWFS identified some uncertainties in the hydraulic containment and protectiveness achieved by the current remedy, those issues are being addressed and do not indicate a fundamental limitation of the remedy. In 2011, the combined VOC mass removal rate from the MEW P&T systems was approximately 35% of the mass removal rate in 1999. This decrease is not indicative of “asymptotic conditions” nor does it indicate that the remedy is less effective than anticipated in the ROD. Although the existing groundwater remedy will not achieve groundwater RAOs for a long period of time due to matrix diffusion effects, that is equally true for all alternatives considered in the GWFS. If treatment is limited to areas outside of existing buildings, would Alternative 4 meet the site objectives for VI given that treatment would not occur at locations where VI is most likely to be an issue? Would it make sense to implement a remedy if coverage of the hot spot is less than 100%, i.e. if the remedy can only be feasibly be deployed outside the general footprint of existing buildings? Could such partial implementation increase VI risk through the creation of a partially-treated transition zone beneath buildings that could contain breakdown products such as vinyl chloride? During the Supplemental FS process and subsequent testing of innovative technologies, citizens also provided comments. Concerned citizens submitted a memo which acknowledged that new technologies could not be applied to the entire contaminated aquifer and suggested decisions to enhance remedies be based on the reasons remediation was begun in the first place. These citizens recommended that new remedies focus on areas with high mass, areas that continue to act as a source, areas that reduce the need for long-term VI mitigation, areas where the detectable plume encroaches on residential areas, schools, and other sensitive uses and enabling reasonable future use of the property. Stakeholders requested that the draft FS include more discussion on the facility-specific limitations and advantages for each of the in situ reductive dechlorination and oxidation technologies. In June 2014, commercial property owners wrote that they were concerned that the Communications Plan was deficient because it did not include a formal comment period, require a written response to comments from USEPA, or provide an administrative record associated with USEPA meetings with interested stakeholders. Most critically, commercial property owners were concerned about the lack of a formal mitigation plan to identify and prevent adverse impacts to properties affected by the remedies. Concerned citizens welcomed the Communications Plan, but called for transparent decisions and decision documentation, a formal opportunity for comment on proposed remedies, USEPA’s process for responding to comments, and flexibility in the cleanup strategy. In April 2015, citizens expressed concern that neighboring property owners “repeatedly opposed the use of innovative groundwater treatment technologies, despite the positive track record of those technologies” to accelerate groundwater cleanup. Citizens supported USEPA’s plan to restart the FS process and did not agree with the property owners that the process would delay cleanup, particularly where construction is underway or planned. Citizens urged USEPA to act quickly, implementing new technologies on parcels before construction took place. In 2009, USEPA published the Proposed Plan for the MEW Study Area that identified USEPA’s preferred alternatives for the VI remedy. The Proposed Plan identified the adoption of a municipal ordinance as USEPA’s preferred IC, but the City of Mountain View and concerned property owners raised concerns that this was not necessary. Instead, USEPA worked with the City of Mountain View, California, to have the City formalize its permitting procedures that apply to future construction. These permitting procedures oblige those proposing new building construction within the MEW Study Area to obtain USEPA approval of construction plans to ensure that, where necessary, the appropriate VI control system is integrated into building construction. This approach proved protective for a recent housing development along Evandale Avenue. When the Evandale OU plume was discovered, residents were already protected by built-in passive mitigation systems, confirmed by subsequent USEPA indoor air sampling. 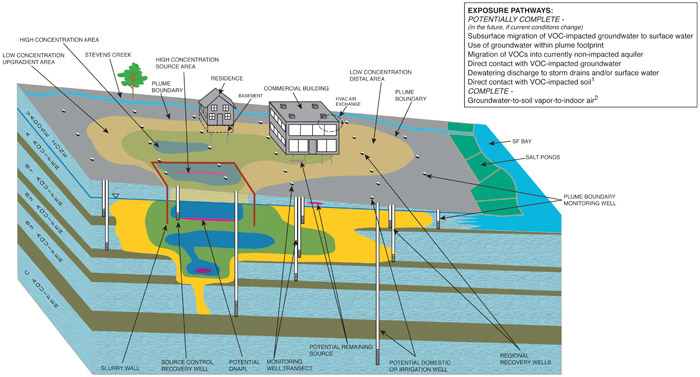 Well over 100 nonresidential buildings, as well as several hundred residences, today lie within the plume’s VI Study Area, complicating subsurface response activity and creating multiple opportunities for VI. In fact, the Moffett-MEW Plume was one of USEPA’s first and largest VI responses. The VI remedy includes ongoing ICs to ensure that the remedy is properly implemented over time and that all parties are aware of the remedy’s implementation and ongoing requirements. There are three categories of ICs specifically selected for the VI remedy. First, for all properties with an implemented VI control system, the remedy requires recorded proprietary controls which run with the land that inform future property owners of the ongoing operation of the remedy at the property. Second, the remedy requires governmental controls in the form of City of Mountain View planning and permitting procedures. These procedures are intended to inform and allow for USEPA to comment when work conducted anywhere overlying the shallow TCE regional groundwater contamination plume may either impact the remedy itself or cause a new pathway for vapors to enter any overlying structure. The ICs also include the implementation of informational mechanisms, which are two-fold: 1) use of an information-gathering service that can keep USEPA and the MEW Companies informed of property ownership changes in the MEW Site area and 2) provision of information to owners and occupants in the MEW Site area to ensure understanding of the remedy and its requirements. At Moffett Field, similar ICs are incorporated into USEPA-approved environmental plans prepared by NASA and its principal lessee, Google’s Planetary Ventures subsidiary. The lessons learned from the more than three decades of environmental response at the Moffett-MEW Regional Plume are as complex as the site. This site is characterized by willing responsible parties, competent and innovative consultants, diligent and capable regulators, and an active, constructive, diverse community. Despite those advantages, key remediation decisions will be pending for years. Project completion is decades, if not centuries, away. Official descriptions of the CERCLA process are generally linear. USEPA identifies a site, then assesses it. Note that federal agencies usually function as lead agencies at their own properties, and frequently state agencies serve as lead regulators. If the site is hazardous, USEPA places it on the NPL. USEPA then investigates the site and develops remedial alternatives, formalizing the chosen remedy in a ROD. If remediation is not complete enough to allow unlimited use and unrestricted exposure, five years after implementing the remedy it conducts a Five-Year Review to determine whether the remedy is protective. In reality, remediation is more like the children’s board game, Chutes and Ladders. Often interim remedies designed for control of contaminant sources are implemented early in the process, long before remedial alternatives are evaluated. Nearly as frequently, it is necessary to conduct substantial characterization after remedies are in place, and particularly if a Five-Year Review finds a problem, to reconsider the entire remedial strategy. At the Regional Plume, the parties have had to take steps backward (down the chutes) to address a new pathway (VI), address new areas of contamination (the Evandale area), and accommodate intense and continuing redevelopment. At the Regional Plume, the finding of nonprotectiveness in the 2009 Second Five-Year Review was decisive. This result led not only the promulgation of a separate, innovative ROD for VI, but also launched a process to implement new groundwater remedies over much of the plume. Under USEPA Guidance, the review of protectiveness should evaluate all exposure pathways and performance of all parts of the remedy, including engineered remediation systems as well as any ICs, LUCs, engineering controls, and public education efforts. The same review elements can be used to determine whether the remedy is efficient, cost-effective, sustainable, and likely to achieve RAOs in a reasonable amount of time. The Moffett-MEW project was fortunate in that the original remedy was not found sufficient to protect building occupants from VI, because that finding triggered an adaptive site management process through which newer technologies are being introduced. Those newer remedies are likely to lead to a faster, cheaper, and resource-saving remediation. Perhaps Five-Year Reviews could be used for adaptive site management at sites where the remedies are still considered protective. Furthermore, in the dynamic world of new investigative tools and remedial technologies, more frequent but perhaps less comprehensive interim reviews might trigger changes to remedies earlier and more efficiently. USEPA’s minimum requirements are for such a review to occur every five years after a construction or implementation a remedy at sites where contamination remains in place. It may be advantageous for site management teams to evaluate the remedies on a site-specific basis and decide on a periodic schedule for the review that is appropriate for each site. At the regional plume, the parties have not hesitated to implement emerging technologies. From the early demonstration of permeable reactive barriers to current in situ pilots, they have remained on the cusp of innovative treatment. From the pioneering use of passive air samplers to high-resolution measurements of groundwater, USEPA and the responsible parties have used the latest in characterization technologies. Although the engaged public has supported these technologies, one segment of the community, neighboring commercial property owners, has challenged innovative treatment approaches. High-resolution groundwater sampling, producing reported TCE concentrations orders of magnitude above those identified earlier, have also caused concern in the community. New technologies, therefore, are not panaceas. They should be introduced carefully to ensure that they do not generate new roadblocks to remediation. Experience thus far at the Moffett-MEW Regional Plume shows that it is possible to introduce innovative remedial technologies to accelerate the remediation of a physically complex site. The parties disagree as to whether accelerated remediation will influence the date by which this heavily contaminated site achieves RAOs—the drinking water standard—throughout the aquifer. Accelerated remediation, however, is expected to reduce the risk of VI and make it easier for site redevelopment to occur. Because there are many source areas and even more property owners—who are distinct from the responsible parties—the decision-making process for considering new remedies is particularly complex. USEPA Region 9 delayed completion of its Site-Wide Groundwater Supplemental FS because it was not clear which new remedies or optimization would be applied where, opting instead to move forward using an informal communications strategy. It is important that facility-specific projects move forward, both to inform the FS and to take advantage of the enhanced access to the subsurface provided by property redevelopment. Yet, at least in the view of some key stakeholders, the interim process does not provide adequate opportunities for all affected parties to influence the transition from conventional to innovative technologies. It would be helpful to establish practices that not only enable the transition of technologies but guide complex decisions during the period of transition. Community engagement has been constructive in resolving disputes among regulatory authorities and responsible parties, as witnessed by the solution to the Navy’s TI Waiver request. Discussion of remedial optimization and new remedies at the Moffett-MEW Regional Plume was influenced by earlier negotiations over the remediation of a smaller VOC plume on the eastern side of Moffett Field, an area not covered by the MEW ROD. The Navy had built a groundwater extraction and treatment system, known as the East-Side Treatment Systems (EATS), using an air stripper to remove TCE, PCE, and other contaminants. This area is difficult to remediate because much of the contaminant mass resides in dense clay layers. In July 2003, after four years of operation, the Navy shut down the system to evaluate its performance. In 2007 the Navy requested that the system remain shut down for a pilot study using enhanced biodegradation. Afterwards, the Navy prepared a Technical Memorandum (Tetra Tech 2008), a draft FFS, and a TI Evaluation. At the time, the Navy requested a TI waiver, which would release it from achieving ARARs for TCE and PCE. Although biodegradation enhancements had some good results, the Navy proposed using natural attenuation, which was considered more cost effective. USEPA and the Regional Water Quality Control Board rejected the proposal and ordered that the EATS system be turned back on. They found that the Navy had not proven that engineered remediation would not bring timely results. EATS thus would to operate longer, with attempts made to enhance its performance, to gather the information necessary to consider shutting it down. It should be recognized that while anaerobic conditions are necessary for dechlorination of the VOCs, other more specific conditions are also critical for an effective remediation alternative. For example, as recognized in the Draft Report, the failure to attain a persistent culture of Dehalococcoides (DHC) may be one reason for the shortcomings of the pilot test. Another reason may be that the hydrogen concentrations are too high, which has been reported to favor hydrogen usation for methanogensis rather than dechlorination (low hydrogen concentrations of 2 to 10 nanomolar [nM] have been considered optimum for the latter process). It appears that optimization (e.g., additional HRC® and/or amendments) may be needed. The community, represented by a RAB and an USEPA TAG recipient, agreed with USEPA’s assessment. These groups were concerned that after four years of spending an estimated $250,000 annually to operate the system, the Navy had concluded that an attenuation-based remedy was warranted. A community comment on the draft FFS pointed out that the Navy used a similar argument prior to building the EATS, that was rejected both by the USEPA and community commenters. One reason the Navy cited for abandoning the biotreatment pilot test was that concentrations of cis-1,2-DCE increased in samples from some wells with no change in vinyl chloride (VC) concentrations, despite decreasing TCE and PCE concentrations in a majority of the pilot test area samples. Reductive dechlorination was occurring, but was not likely proceeding to completion. The Navy suggested that Dehalococcoides spp. was not present in sufficient quantities or was incompetent to complete the reductive dechlorination process. Yet, community representatives noted that at a nearby site at MEW, with a similar hydrogeological setting, Intel and Raytheon had successfully completed dechlorination by augmenting the population of bacteria and adding other nutrients. The TAG recipient explained that in situ bioremediation for this area and the Intel/Raytheon site had shown targeted reductions in VOC concentrations. It supported achieving site objectives within a reasonable time. However, it argued, even if this might not be possible, making progress towards those goals could still be accomplished with some of the technologies identified. The draft FFS for the eastside area observed that there is no current exposure pathway, but the community argued that this was insufficient to allow contamination to remain above drinking water standards. The contaminated groundwater is defined as a “potential drinking water source” by the state of California and is therefore legally protected. California faces water shortages, and “we expect that it will face them for some time to come. Preservation of potential drinking water sources—as well as the protection of aquifers as storage basins—is essential.” The no-exposure pathway argument did not take into consideration future uses of the site, or the fact that a VI pathway may be relevant to these future uses. The Tech Memo asserted that continued treatment would be too costly, but the NCP Preamble states that TI determinations should be based on “…engineering feasibility and reliability, with cost generally not a major factor unless compliance would be inordinately costly” (Tetra Tech 2008). Thus, community members argued that the Navy could not halt treatment simply because it cost more than doing nothing. The TAG Recipient recommended that the Navy follow the adaptive site approach put forward in the NRC report (NRC 2003). Adaptive management stimulates the search for new, innovative technologies to replace older or inefficient approaches, and it stresses the need for pilot programs to test both new technologies as well as modifications of existing technologies that might enhance their effectiveness. In a meeting with USEPA, the Regional Board, the Navy and the TAG recipient, all parties agreed to stop the request for a TI waiver and continue with in situ bioremediation at the most highly contaminated areas of the east-side aquifer, while allowing MNA to treat the rest of these areas. USEPA and the Regional Board agreed that they would not require the Navy to start the P&T system again.